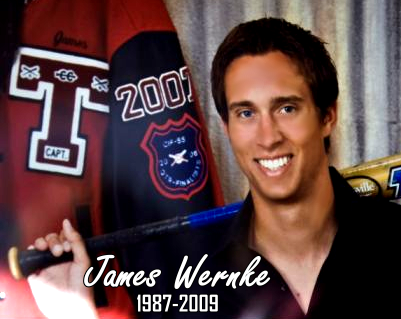 to a selected Southern California Renegades pitcher in memory of James Wernke. Authorities believe Wernke was swept away by the creek, when the water level was between six and eight feet. Wernke’s mother, Sheri, told the Register this week that she thinks her son let the dog off the leash and had to get in the creek to rescue the dog, which might have jumped into the water. At the service, many described the 21-year-old as a loving man and dedicated athlete. Wernke was looking forward to making his debut as a Santa Ana Don in January before transferring next summer to Cal State Long Beach on an athletic scholarship. Attendees donned baseball jerseys, many marked with “Wernke” and the number “5,” which he wore when he pitched for Troy High School. Even one of the fathers who led the service put on a baseball cap to “be in character with all of you,” he told mourners. The closed casket was brought down the aisle by six pallbearers, Wernke’s friends, who dressed in full baseball uniforms. The body will be taken to Colorado where Sheri, and father Bob Wernke live. Wernke’s only sibling, older sister Kristina, said the past week has been a nightmare and that she is struggling to come to terms with the loss. As the service came to a close, mourners belted out “Take Me Out to the Ballgame.” Bob Wernke stood near his son’s casket as the crowd sang, and at one point he broke down in tears and rested his head on the casket. After the song, Bob Wernke compared the death to a starting pitcher being relieved from the mound after pitching a stellar game. Telling the priest that for at least this moment church decorum would have to be excused, he asked that everyone give a standing ovation to his son as the casket made its way back up the aisle. Not a single person stopped clapping until the body was returned to the hearse. Share the post "James Wernke Award"